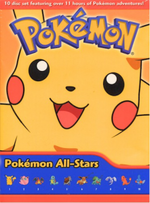 Description In celebration of Pokemon's 10th anniversary, ten DVDs commemorating the top Pokemon characters as selected by votes from fans were released. Each disc showcased a single character with 3 classic episodes featuring its adventures. Now, this All-Stars collection features all ten volumes in one box set! Contains all 10 volumes of the Pokemon 10th Anniversary Series! The Lizardon Valley! Till the Day we Meet Again! The 5 Eievui Sisters! Battle at the Tea Ceremony!! A Promise is a Promiseルギアとのやくそく！The Promise to Lugia! Goodbye, Fushigidane! Adventure in Okido's Garden!! Decisive Tournament! Full Battle 6 VS 6!! Rival Confrontation! Kamex VS Lizardon!! Ziguzaguma and the Kid in Short Pants! Haruka Battles for the First Time!! In the Knicker of Time! A Secret Pond! Lots of Mizugorou!? The Assault of the Konohana Tribe! Those Three Appear! The Referee School Island!